Posted on August 9, 2012 by Jenn H.
Hello all my bloggy friends! Are any of you out there addicted to Etsy? LOL….silly question, I know…of course you are! I have found some of the best handmade shops over the years on Etsy and now I’ve found another great find for you that is just too good not to share!! The name of the shop is Malena’s Gourmet Creations. 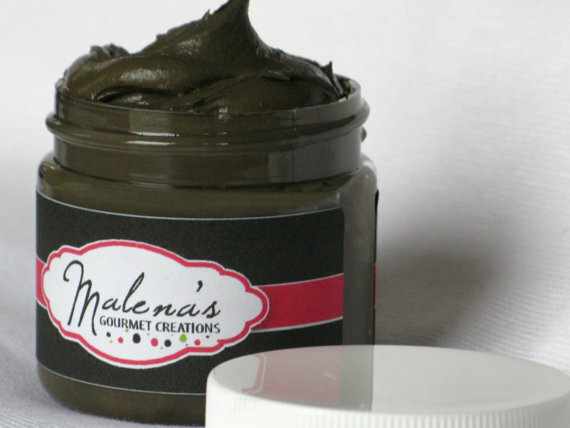 Malena’s Gourmet Creations specializes in making completely natural, handmade soaps, lotions, lip balms, mud masks, moisturizers & more! I love the fact that in her description of each product, she lists the ingredients along with the benefits of each ingredient! It’s kind of like a little science lesson! For instance, Papaya Extract is good for stabilizing oiling skin, as well as a good exfoliant for removing dead skin cells! Who knew? Another plus is when you order, your shipment is sent out pretty darn quick. I ordered and received my package within a week and it was packaged super well with bubble wrap and tons of pink tissue paper! Even living in Florida and my package sitting outside in the heat, everything was perfectly fine when I opened my package. It’s hard to pick a favorite item, as everything I’ve tried has been excellent, but if I had to pick I would say it’s the Massage Lotion Bar in the scent “Viva La Juicy”….it smells Aaa-Mazing! I had never heard of a lotion bar before, so I thought I’d try it out and I’m so glad I did. It comes in a little metal tin for you to keep it in, so you can throw it in your purse or keep it on your desk for whenever you may need it. It’s super moisturizing and it doesn’t leave your hands all greasy feeling, like some lotions do. Plus, this has little ridges around the heart shape, which gives your hands an excellent massage when applying! It comes in so many different scents, it’s hard to choose, but I highly recommend “Viva La Juicy”. It smells so good! If you’re a lotion person & travel….this would be an awesome item to get since it’s not a liquid and you wouldn’t have to try to cram it in a quart size baggy with all your other liquid cosmetics! My next favorite item I ordered was the lip balm. This stuff is the BALM! Haha…bad joke, but, seriously….it’s off the hook! 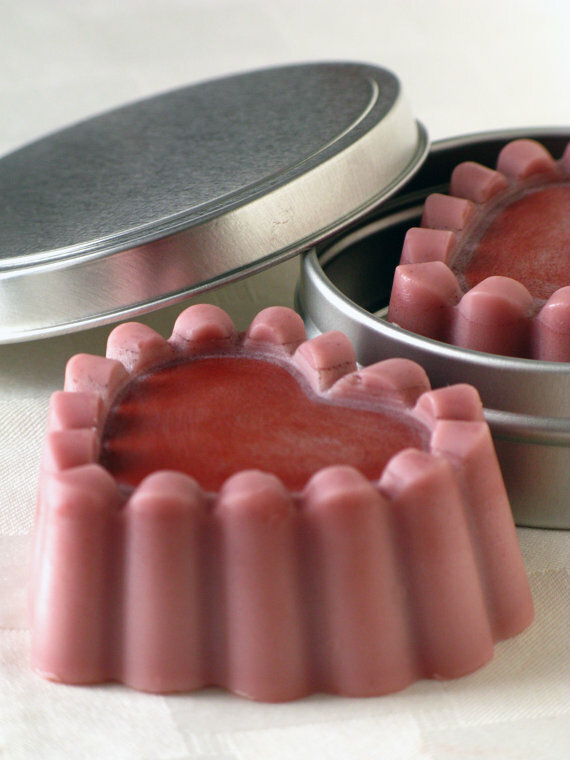 It contains things like beeswax, sweet almond oil, jojoba oil, shea butter, cocoa butter….so super moisturizing! What I love is the fact I don’t have to constantly reapply like you do with some lip balms. This moisturizes so good…it literally lasts for hours. Plus you can get it in numerous lick your lips yummy flavors. I went with the “Pink Frosting” flavor due to my love of cupcakes. I think the next flavor on my list to try is “Cotton Candy”. YUM!! Anyone out there love face masks? I do! If you do is well, you’d love the Dead Sea Mineral Mud Mask! This is a pretty thick mud mask…I would almost describe it to have a clay like texture, which is great because a little goes a long ways! Just put on a thin layer and let it dry for 15-20 minutes and then wash it off with some warm water and leaves your skin feeling so smooth & refreshed! Now for a little surprise for all you lovely readers out there! Malena was sweet enough to send me a couple bars of soap with my order & I’d like to give you all a chance to win one of these bars in a giveaway! I have two full sized bars…one in the scent Crisp Lettuce & the other in the scent White Truffle Raspberry. I tried out a sample bar of the Frosted Cranberry. Loved the soap…it lathers up really well and leaves you smelly good and leaves you squeaky clean! 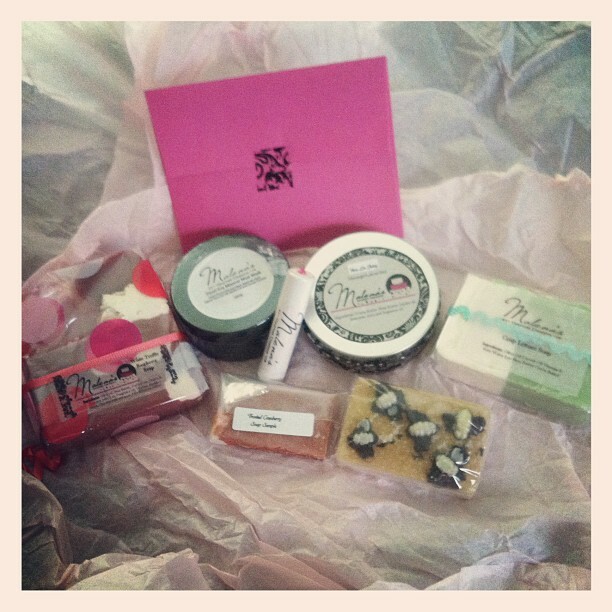 To be entered to win the Malena’s Gourmet Creations Soap Giveaway, all you have to do is follow this blog & visit Malena’s Gourmet Creations Etsy shop & leave a comment of which product you’d like to try out for yourself. For another entry, “like” Malena’s Gourmet Creations on Facebook & leave another comment that you did so. While I’m still deciding on whether to transition my blog to wordpress completely, you can also follow & leave a comment on my blog here for an additional chance to win. I will pick two winners and the contest ends on Friday, August 17th at 8pm EST. Best of Luck & spread the word on the giveaway! Wouldn’t want anyone to miss out on getting to try out a pretty great product!